Setting out his vision to "re-imagine our future", he promised a "totally different" politics from Mr Trump. In a veiled attack on the Trump administration, he railed against the "myth being sold" by those who sought to "stop the clock and turn it back". "It is time to walk away from the politics of the past and toward something totally different," he told supporters at his launch event. 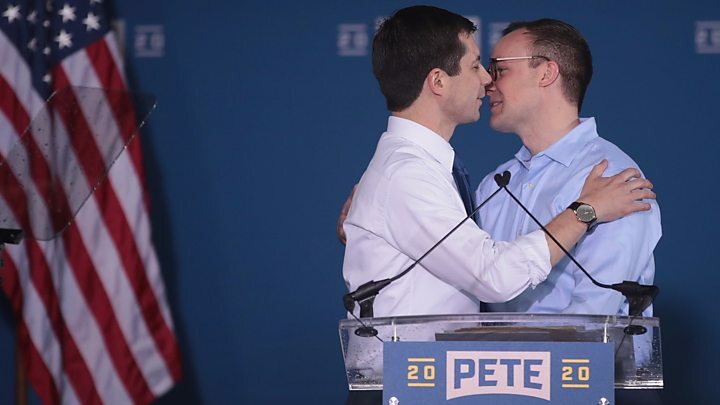 Mr Buttigieg's track record as mayor of South Bend, which has seen a struggling economy improve during his tenure, has also earned him plaudits. At the rally, Mr Buttigieg sought to differentiate himself from rivals as a candidate taking the "long view", especially on issues such as climate change. "I recognise the audacity of doing this as a Midwestern millennial mayor," he said. "More than a little bold… But we live in a moment that compels us each to act. The forces changing our country today are tectonic." The video announcing he will run for president focuses on his role in the Rust Belt city's redevelopment and also takes aim at corruption and infighting in Washington. Who are the Democrats in the race?